Four friends in a weekly poker game. A burglar breaks in. They kill him. It looks bad (they tied his hands; he tried to escape and one of them baseball-batted him). They don’t report it and dump the body. From a novel by Ed Gorman, Johnathon Schaech produces, co-screenplays and stars in the tight thriller, THE POKER CLUB. If you’re looking for poker action, go watch ROUNDERS or 21. 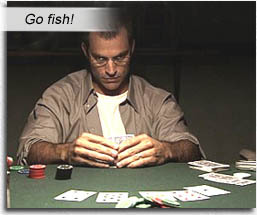 Despite its title, we get exactly five minutes of poker as an establishing shot, then the movie concerns itself with how the burglar’s death affects the four friends of The Poker Club (quaky Loren Dean, beanstem Michael Risley, dynamic Johnathon Schaech and Chippendaler Johnny Messner). Part psychological thriller, part gore-fest, all indie filmmaking. A couple of twists you can see coming and a couple you can’t, some good acting and some bad acting, motivations which seem untidy and some which we can buy; all in all, the most fun you can have watching a poker movie without actually watching a poker movie. Writers: Richard Chizmar, Johnathon Schaech, Ed Gorman. Starring: Johnathon Schaech, Loren Dean, Michael Risley, Judy Reyes, Lori Heuring, Johnny Messner.